The MyCar is a striking little thing – design house ItalDesign certainly earned its fee, managing to make this short, narrow, three-box quadricycle look like a pocket-sized sports car. The sport part is almost entirely illusory, sadly. The MyCar has a top speed just south of 40mph and in our road test it climbed to that not-very-lofty peak in a leisurely fashion. The rear-mounted DC motor offers just 3.7kW (5bhp) of go-faster action but it does drive the rear wheels, which is kind of sporty. And a light tug on the high-set, blingy three-spoke wheel sees the MyCar change direction like a startled hare. Lead-acid batteries under the seats store 9.6kWh and can be recharged in five hours using a standard 240V supply. 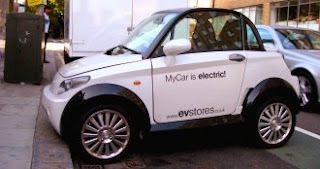 You are then good to go up to 60 miles – although UK distributor EV Stores admits that heavy use of the throttle will see the useful range drop as low as 35 miles. There’s a simple way to sum up all of the above: the MyCar offers inner city transport and nothing more. Don’t venture onto a dual carriageway unless you enjoy seeing an HGV radiator filling your rearview mirrror. The MyCar, built in Hong Kong by EuAuto Technology, costs from £9,995 on the road in the UK, and London-based EV Stores says it is currently selling two a month. The first thing that strikes you as you climb aboard is that the doors are not at all big. There’s enough headroom for a six footer, but having parked your bum on the low-slung seat you will likely need to fold yourself up like a gateleg table to get your other foot on board. The doors will then probably take two or three slams to shut properly – not because they are ill-fitting, but because their flyweight construction makes it difficult to swing them in with sufficient momentum. The windows and mirrors are electric - controlled by switches down by the gearlever - and there's a simple strap to tug on during repeated attempts to shut the door. The gear stick itself is a dainty little lever, like the joystick from a 1980s video game. It offers forward, reverse and neutral positions, and to switch between one selection and another you must first lift a slim chrome collar. We wonder what happens if you neglect to lift the collar - we fear the whole lever might snap off. Even a fleeting glance at the MyCar will tell you that it’s a small car with big wheels - the overall length is 2.65m, the wheelbase 1.69m. These dimensions are, incidentally, virtually identical to those of the Reva G-Wiz. The MyCar is 20cm lower, a fraction wider, and has fewer seats, of course. The MyCar’s 15-inch wheels are also a couple of inches bigger, while both G-Wiz and MyCar have turning circles to shame a London Taxi. All these dimensions add up to a problem in the footwells. Wheelarch intrusion is severe, and the pretty aluminium pedals are notably offset towards the centreline. It actually feels slightly worse from the passenger seat, where you tend to sit with one foot on the wheelarch and your left knee in your face. On the road the MyCar feels small and narrow and low, but surprisingly airy thanks to its glass roof. But while the brakes and the steering are good, it’s the all-important accelerator pedal that spoils the party. For the first three quarters of its travel, nothing at all happens - to the extent that we thought we’d forgotten to switch the car on. The final quarter of travel yields linear and controllable progress, but makes you feel that you’ve left the handbrake on. Because you sit low, and the motor behind you makes an appreciable amount of noise, it feels like reasonable speed, but the numbers on the digital speedometer don’t lie. This is a slow car. So slothful is the MyCar that we can’t honestly recommend it. It might make the G-Wiz look like an extra from the Postman Pat set, but the gawkier car is actually the better bet. With its current power pack, the MyCar is a sad case of nice legs, shame about the pace.